Visit Addo Elephant National Park, South Africa’s third largest national reserve and home to the densest elephant population in the world. 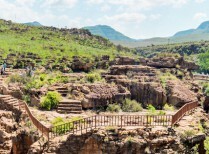 The Park has expanded to become the only park in the world to lay claim to Africa’s “Big 7” – elephant, rhino, lion, buffalo, leopard, southern right whale and great white shark. 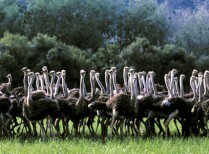 Other animals include zebra, jackal, bushbuck, kudu, and other species of antelope. The flora within the Park is quite varied, and like all plant life, is a central factor to the ecological system in place. Several species of rare and endemic plants, particularly succulent shrubs and geophytes are native to the South African region within the Park. 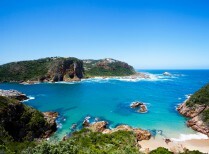 Visit South Africa’s third largest National Park, just 75 kilometres from Port Elizabeth. Spend a full day in the magnificent Addo Elephant National Park, home to the densest elephant population in the world. Experience close encounters with elephant and other mammals. You will also have the opportunity to look for buffalo, black rhino, zebra, jackal, bushbuck, kudu and other species of antelope. 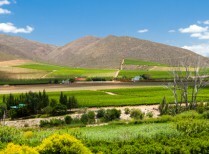 This journey sets out on the road less travelled through the Cape Winelands and the evocative Klein Karoo before traversing the Outeniqua Mountain Pass and descending to the lush Garden Route coastline. It is a circular route, ending back in Cape Town via the coastal roadway so you take in all the fantastic highlights of this beautiful region.